PURVEYORS of prog for over three decades, YES took to the stage at the Usher Hall last night and gave the crowd a fine selection of their extensive back catalogue. This band has had more line-up changes than The Sugababes have had so, while this was not what might be considered the classic YES formation with Steve Howe on guitar and Chris Squire and Alan White providing the rhythm it was, as far as the audience were concerned, YES enough. There was even a Wakeman in the line-up with Rick's son Oliver taking keyboard duties and proving to be a fine tickler of the plastic ivories with, fortunately, none of his father's dress sense. And completing the line-up, vocals came courtesy of Montreal native Benoit David. David, formerly the singer with a tribute band, clearly had the vocal chops to carry off the performance but his stage presence was a different matter. Dressed in velvet waistcoat, pirate shirt and white trousers he looked like a cross between an early 1980s holiday camp entertainer and, when dancing with Squire, a slightly fey leprechaun trying to entertain an ogre. Add the fact that someone had clearly misled him as to the tambourine's place in rock and it was obvious his music god status still needs work. Musically the band were as tight as could be expected and when in full flow on songs such as the soundscapey Onward or the progtastic Metal Messiah there was an almost hypnotic power to the tunes. It would have been even better if the first 30 seconds of vocals on each song hadn't been lost in the mix. There were songs from the early days and more recent material as well, which went to show just how much of a musical journey this band had gone on. Owner of a Lonely Heart, the band's big singalong hit from the 1980s was brought out in the second half but amongst the 12-15 minute musical behemoths from the early days it seemed a piece of insubstantial fluff. The enthusiastic crowd clearly had their favourites, but each number received a passionate response from their legion of fans and when Heart of The Sunrise was played shortly before the end it got a well deserved standing ovation. A highlight of the evening was Steve Howe's two acoustic numbers. He played beautiful and intricate patterns on the instruments with a laid back skill that makes players a third of his age want to smash their machines with jealousy. No matter which line-up of YES takes to the stage the real star is the music. Powerful, driving, wonderfully complex and full of the, occasionally ludicrous, self importance that modern bands are too knowing or cynical to put into their tunes. This may not have been a perfect show, the mix was often poor and there were some technical problems but if proof were ever needed that prog rock is alive and healthy as ever this was it. Having Yes before on the 90125 tour i was interested to see & hear how they would perform on the night. We (my friend & myself) were totally blown away, everysong,bar Owner Of A Lonely Heart,was excellent.Heart Of The Sunrise well how can you describe that to someone who wasn't there,to say it was the heaviest thing i've ever had the pleasure to hear live(something i don't equate with Yes) would be doing it an injustice. What an absolute pleasure to hear Onward(an absolute gem) & Machine Messiah(Drama is a truly underrated album),only gripe(and it's small) where was some stuff off Going For The One. A truly memorable evening would have been made more special had Chris used a double neck bass(my favourite Prog instrument) but that's just me. Thanks to YES for making my life more pleasurable. Steve's solo was Beginnings and Clap. Firstly, a declaration of interest. As the vocalist of Fragile (Europe's Premiere Yes Tribute Band) I have had the pleasure of performing with Steve Howe, Alan White and Peter Banks. Our keyboard player (Max) has recently been writing with Jon Anderson, Rick Wakeman has endorsed our original project (Aquaplanage) on his Planet Rock radio show, and we have recently performed at a Roger Dean retrospective event. So the links with Yes are strong, and we have been welcomed into the Yes family with open arms. I stared seeing Yes live in 1972 as a fan, and now in 2009 I remain a fan, but also possess an unique insiders view about how this magical music is performed. I think the reviews of the Usher Hall gig are telling. The consensus is clear, namely that Yes delivered and that the current touring line up are as much part of the band's legacy as any version before it. I love Jon, but Benoit did the music justice and I know how difficult this stuff is to sing! People have remarked on Steve's energy and Chris's flamboyance, and I agree they were reborn as performers last night. Alan dug deep and delivered, and Oliver warmed as the evening went on. By the end they were a cohesive whole and there was no sense of a poor man's Yes (as reviews from some earlier shows have suggested). I love Yes in all its forms, and having played with Steve and Alan I know that they take the same view. I thought the set was creative and it was great to hear material from Drama, Tormato and Time And A Word. The sound was spot on for me, and although people have remarked about Benoit's profile in the mix, I sense this was more a conscious decision to effect a tonal blend rather than any hide and seek. Rest assured, the guy was there and on the money where every line was concerned. He ducked nothing and for me brought some original embellishments to well known Anderson melodies. The bass was thunderous and locked the ship together wonderfully. As for Steve, he cooked, and having had the pleasure of him performing alongside me, I know how electric that can be. I'll leave others to comment on the set detail and end by saying that the joy of hearing the music far outweighed the absence of dear friends. That guys into their autumn can put on a performance of this kind well into a demanding schedule is something to be admired and respected. That a vocalist of the talent possessed by Benoit can be dismissed by some as simply a 'tribute' singer only serves to miss the point and displays their ignorance. Last night a version of Yes delivered one of the best gigs by the band I have ever seen (far better than the Wembley show in 2004 by the classic line up). It was also a joy to see the band in Edinburgh where I now reside and the Usher Hall crowd did Scotland proud! Finally the line between reality and imitation is fine, whether its Benoit with Yes, or Steve and Alan with myself and the guys in Fragile, the glue remains the music of Yes. When its performed with passion, ability and respect, the question of who does it, and why, in all honesty is irrelevant. Time is at a premium and take the moment while you have it! Well after waiting all day for this concert it sure did not dissapoint.Highlights were Tempus Fugit Machine Messiah South Side of the Sky and a truly memorable Heart of the Sunrise. Agree that Owner of a lonely Heart was a bit messy. Benoit David is a very good replacement for Jon and although young Master Wakeman had a few keyboard problems thought he was still good.From were I was sitting could not see much of Alan but heard him and did not think that he had any problems. Chris was his usual self bouncing around on stage and is still a great showman. As for Steve what can you say forget all other rock guitar gods there is only one and that is Mr Steve Howe. How his hands were not on fire I do not know. Could this band make a new album do not see why not.One final thought if only Oliver could have borrowed one of his dads capes!!!!!! Did anyone at the gig last night have the misfortune to travel via the A80 last night? It took me three hours to reach the Usher Hall and didn't get shown to our seats until 8.20pm when Yours is No Disgrace was just starting. The remaining part of the concert seemed to fly by in no time so that must be an indication of the musical quality being served up. Couldn't believe how well Benoit filled Jon's boots although at times he seemed to get drowned out by Chris. Highlights for me were South Side of the Sky and Machine Messiah which were absoutely breathtaking! Hope this is not the last time we get a chance to see Yes, no matter what he line-up is. P.s-can anyone fill me in with what I missed at the start? Lifelong YES fan spanning 36 years so I have seen the band on many occassions on many different tours. As a huge Jon fan I went to Edinburgh with an open mind but with some trepadation at the new line up. I left the show totaly stunned at the bands performance. I feel a need to give Benoit a special mention. To get up there and sing songs from the YES catalouge knowing the pressure he was under is hugely commendable (we all remember the Drama tour!!!). Benoit was outstanding in every way. Yes he was down in the mix at times but he showed he is a very talented vocalist and fitted in very well with the whole band. Steve, Chris and Alan were all superb as was Oliver - tech issues asside. One of the best YESSHOWS I have seen in all the years I have had the pleasure of seeing the band. As a 50+ year old, for some reason or other I did not engage in the music of YES when I was a teenager. I am endebted to my son Brian (see previous review) for the introduction to their music. What a fantastic night at Edinburgh's Usher Hall last night! I hope to get many more opportunities to see such talented (and tireless) performers in action. After all, I have got some catching up to do. Thanks guys (and thanks Brian)! I've been to a number of Yes concerts since the Fragile tour in the 70's and I've never been disappointed and after tonight Yes' record is still 100%. Benoit David is a very credible replacement for jon Anderson - his singing was excellent throughout and he completely overwhelmed me with his absolutely perfect performance of Heart of the Sunrise. Like others I thought his voice was lost in the mix a few times and sometimes drowned out by Chris but he was audible most of the time and it was such a pleasure to hear him. Steve seemed to be really enjoying himself and his playing is as flawless and creative as ever. Chris was... well, Chris - brilliant! Can't say I noticed any problem with Alan's timing or pace - he was as great as ever. Oliver Wakeman is excellent - at times the keyboard parts seemed just too easy for him and in contrast to other reviews I've read he siled a lot and was clearly enjoying himself as were the rest of the band. It was great to hear the Drama tracks and Onward from Tormato - this was the first indication of how very good Benoit is. All in all a great night. I'm now listening to it all again courtesy of the MP3 stick which was available after the show - what a great idea! Thanks Yes - come back soon. 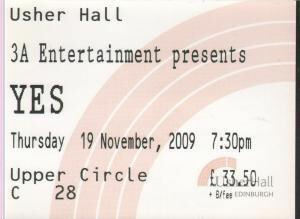 Being 19 I was very glad to have the chance to see YES perform live. I never thought this opportunity would arise. Although young I am a lover of all YES albums and have no qualms about any albums being better or worse than any other as YES music needs to change to be as interesting and fulfilling as the first albums. It keeps that �YES� sound fresh. The set list was very pleasing and the lighting added another dimension to the show. To see the DRAMA songs performed live was a highlight for me as I personally believe that it is a hidden YES treasure. Fantastic! Benoit was wonderful. He sung his heart out and engaged with the audience and other band members. Oliver had problems with his moog but handled it well. He is just as good as his father and kept true to the songs but when given the chance he had his moments to shine in his solos. Chris was a joy to watch perform his vibrant dancing on stage and all of his other moves are what he is all about. Alan played well and the interactions with Oliver showed that he was having a good time. Steve was on fire. He was having the time of his life on that stage and his smiles made me smile with him and the rest of the band. Amazing that he can still play like that at his age! I hope that the rest of the crowd feels the same way as I do. It was a very special moment to see YES perform for old and new fans alike since it�s been so long. One last thing to say for the people who don�t quite understand the new line up; If the members can have fun and get along on stage, which they obviously were why can�t we as the family of YES fans not do the same? Here is hoping for many more years of YES music whatever the line-up.